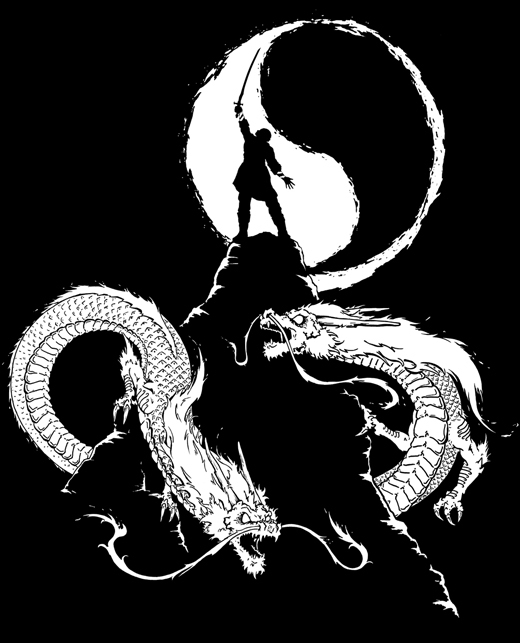 Officially licensed by the Wheel of TimeTM, The Dragon Reborn is the third shirt design that I created for Ta’veren Tees, hopefully the third of many more designs. Continuing in the same style as the previous piece in the series, this art features Rand Al’Thor, standing atop Dragonmount. Reminiscent of the original Darrel K. Sweet cover for The Dragon Reborn book (book 3 of the Wheel of TimeTM,), Rand reaches for Callandor which floats above him, brimming with the One Power. Other portions of the piece are homages to the series, though not necessarily taken from a particular scene.The twin dragons, which are permanently tattooed onto Rand’s forearms (not real dragons in the books), are clawing their way up the mountain’s steep edges. And the ancient symbol of the Aes Sedai, the white flame and black fang, lies behind Rand. This piece is one of three, including The Prince of Ravens and The Wolf King.